A hungry wolf was out hunting for food near a farm. 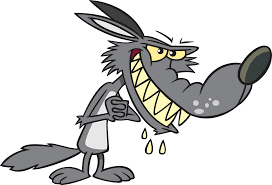 The wolf overhears a mother angrily disciplining her child: “If you keep crying, I’ll throw you out as food for the wolf!” ‘Yum.’thinks the wolf. The child cries all night; the poor wolf waited infatuatedly until it started to light and then sighed with tears in his eyes: ‘Liars! They’re all bloody Liars!